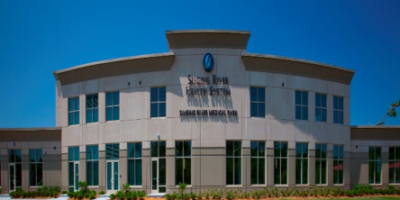 Singing River Health System comprises two hospitals and multiple outpatient clinics and facilities. It is the strategic healthcare partner driving growth in Jackson County on the Mississippi Gulf Coast. This dynamic system, working with industrial and residential partners, has played a major part in Pascagoula’s quick recovery from Hurricane Katrina. Working with the leadership team from Singing River, Johnson Development and the design team created a new 76,000 square foot multi-specialty facility that will handle new services, growth in outpatient imaging, and the creation of the NeuroSciences Institute. The efficiency in design achieved cost benefits in staff allocation of the hospital departments involved and decreased the operational and lease costs. Wellness, a new service line introduced here, is a 25,000 square foot state of the art facility that will be supported by over 16,000 square feet in physical therapy and cardio-pulmonary rehab. Outpatient imaging has outgrown its current locations and occupies approximately 15,000 square feet (with lab). The balance of the space is the new NeuroSciences Institute with pain management, neurology, and a growing neurosurgery practice consolidated on one floor. The building will provide a welcoming, positive outpatient experience for patients and their families.